You must have read many magazines in your life…Magazines reflect your interests. There are fashion magazines..sports magazines, computer, technology, gaming.. etc etc. which you might have read…But have you read any good Islamic magazines? I hadn’t… and as a child i was only addicted to Young Times ( Of Khaleej Times). I never came across any good, quality islamic magazine. All i knew was Takbeer which my nana used to read. I found it rather boring.. printed on low quality paper.. colorless… and since i was never too fond of reading urdu.. i never really looked at it much. It only costs Rs. 450 in Karachi for an entire year ( 4 issues), Rs. 650 outside Karachi and USD 30 outside Pakistan. You can easily subscribe by printing out this form and mailing it to the address provided. If you would like to know more details about this magazine, you can visit their website here,unfortunately it is not updated regularly and still has a number of broken links.. but you can get an idea about the mag and will Inshallah decide to subscribe. Next Post 27th August 2 Moon Hoax /Mars As Big As Moon Hoax! Awareness Campaign message for Umrah Pilgrims regarding the use of Mobile (Cellular) Phones in Al-Haram Al-Sharif’s (Makkah Al Mukarama and Madina Al Munawara). In the Holy month of Ramdan more then 2.5 million Muslim travel for Umrah in each year and hundred of pilgrim stay in Al-Haram Al-Sharif’s for Itikaf and Taraweeh. “Most of the pilgrims use different musical tones in mobile phone when receiving calls in Al-Haram Al-Sharif’s other pilgrims get disturbed in their prayers. This act is unethical and unacceptable for Muslim and against the respect of Al-Haram Al-Sharif’s”. I hope you will do your best for the promotion of this Awareness Campaign. You are requested to kindly use your good office. May Allah Subhanawatallah will give you the best reward for this noble act. The message attach with this email. Accept my kind wishes and best regards. نرجو منكم التكرم بعدم استخدام النغمات الموسيقية في جوالكم (موبايل) خلال أداء مشاعر العمرة، وتواجدكم بالحرمين الشريفين، بل حذفها نهائياً من الجوال. ووضع الجوال في حالة الاهتزاز/ صامت قدر المستطاع، أو إغلاقه خلال تواجدكم بالحرمين الشريفين. حتى لا يقع أي خلل في عبادتكم وعبادة بقية المعتمرين. والمحافظة على تقدس الحرمين الشريفين. نتمنى منكم العمل بهذا الرجاء، وتبليغه إلى بقية المعتمرين. تقبل الله منكم عمرتكم وندعو سبحانه وتعالى أن تكون عمرة مبرورة، وسعيا مشكورا، وذنبا مغفورا (أمين). Deliver A Messiah, “Mistaken Identity” by Agron Belica brings forth an elaborative examination of who was put on the cross. Many theories suggest that the son of Mary (aka Jesus Christ) was not the person placed on the cross, but someone other than Jesus Christ himself. The author takes you through an examination paving ways of new insight of who might have been put on the cross. To contribute to the present work, the author investigated and researched to seek the truth about the assumptive facts leading up to what people of Christendom believe to be the crucifixion of Jesus Christ. The Bible and the Koran are the main resources used as references formally presented in use of persuasive arguments and theories of why the author strongly does not believe that the son of Mary was killed nor crucified. The author has made every effort to be as unbiased and objective in presenting the facts and interpreting the events in this present work. The author is not trying to stir up controversy, but only wishes to lead people towards what might be considered the truth about the events believed about the crucifixion. The author strongly believes that the prevailing powers during that era have camouflaged the truth. The cover-up of the crucifixion with a false pretext was to lead the masses of people in the past and at present to believe, that the son of Mary was really crucified, by the leading elite that was influenced by the Jewish religious hierarchy at that time. Kya horaha he bhai? Is post ko jaane dete kya tha. Is mein bhi pehlu dhoondh bethay. Politics is the only thing that intrigues me the most, and if someone calls it boring, I’d obviously be offended. Anyways, can’t blame you for not being interested. As i mentioned before, most of these magazines are non-commercial and are either distributed on a “fee sabeeliLLAH” basis or at a very minimal cost of around Rs. 25. What quality would you expect for something that costs so less? YES, Islamic content should get the quality it deserves, however, for avid readers, content matters a lot more than quality of the paper. yar ibrahim bhai thanks a lot. Boht tight website lag rahe hey. I would really explore this and forward to my friends. Also I would sure bug you one the idea gets finalized. jazakallah! You said it your self.. it was more of a political magazine…so if that bores me.. it shouldnt bother you much. If you look at the contents of Hiba Magazine.. they are not political at all. but all articles are from Quran And Sunnah and on Muslim heros and current issues in following islam. What i have hated the most is that.. why is it when it comes to publishing books on Islam… the most lowest quality printing.. lowest quality paper and design format is used?.. doesnt Islam deserve the best? Thats why i totally love Darussalam books and harun yahya books…. They are quality publications, printed on quality paper and designed beautifully. Same for hiba magazine.. call me whatever you want …but the way anything is presented matters alot. @ Jav: I have some serious reservations against your comments on “Takbeer” being boring, it used to be the only magazine back in those days that used to publish the truth, and nothing but the truth about the political dirtbags during the time – until Syed Salahuddin was martyred due to his vast knowledge of the deep-rooted criminals. And guys, in my case, my FATHER used to read it back then, and may ALLAH bless him, he still reads it. Its good to see people working up things to spread Islam. 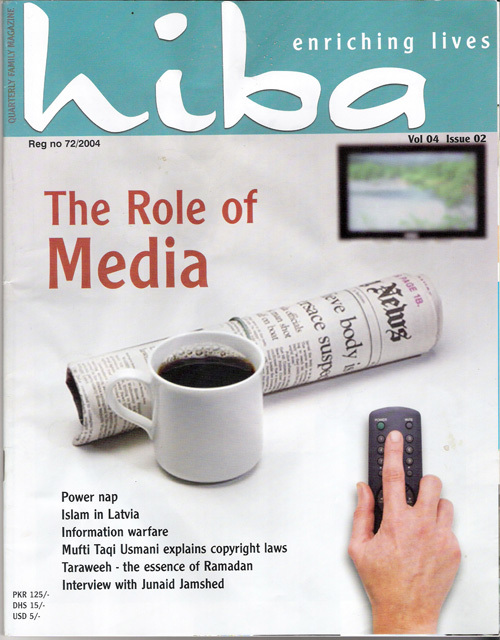 Hiba magazine apparently is a grand milestone in this aspect. Nevertheless, there are several similar publications that are being published on NON-COMMERCIAL basis and are usually distributed for free. Most of them are published by Maktabah Darussalaam or other such makaatib. SubhanAllah, to propagate the site, I just put a link with my nic, which will take you to http://www.islamicurdubooks.com. These people, may Allah accept their deeds and reward them with good, have already started on the path of what you are talking about, Adnan, may Allah reward you for you intentions. They provide both the arabic script and urdu translation. The six known hadith books (saheeh sitah) have been translated and they can be found at many stores in Pakistan. Also, mawta of Imam Malik and mawta of Imam Muhammad (Muhammad al-Shaybani) has also been translated in Urdu, but I don’t know if anyone of them are online. This site will inshaAllah one day have most of them. Orginial Arabic is widely available and if you need online version then email me. Also, brother Adnan, have a group of real, authentic scholars supervise any of your Islamic digital work, whether that be translating something online or creating a desktop application. This note is for many books but mainly for hadith, tafseer and orginial fiqh books because you don’t want to be making a mistake, and later being accused of tahreef. Being a technology person, I have always wished to use technology or modern modes to spread Islam + following traditional tableegh process that is meeting your islamic friends and discuss Islamic topics. I have ancient copies of SAYYARA DIGEST of 70s. My dad collected editions like Sahabi Number,Rasool Number,Quran number etc. All are great. I wish I could have digial copy of those. p.s: do you guys know any authentic online source of hadiths in Urdu? me and my friends are planning to write a software but we are unable to find main thing that is database of hadiths in Urdu. if any of you know then do let me know. I need a copy of Sayyarah Digest regarding the life of Prophet(pbum) before the prophethood.It was written by a non muslim and published by Sayyarah Digest in seventies,I think. jazakAllahu khairan for informing us about this magazine. It is really heartening to see such an effort, meaning a well balanced magazine which is ‘mainstream’ Islam….not some progressive/fake propaganda. I’m just saying this because of people out there like Babar Choudhary of fake Ar-Rahman Ar-Raheem (they use actors/actresses and acting to preach Islam besides billions of other problems) and Javed Ghamidi, the ‘scholar’-screen writer of our time (he wrote the script for Shoaib Mansoor’s tuhfa for the Muslims), et el. Incidently, Takbeer used to come for my nana too and we used to read it, subhanAllah. Takbeer and boring?! pasand apni apni! That magazine was a good effort but was quite political. May Allah subhanahu wa taa’la accept Salahuddin sahib as a shaheed. Although you are right there has been a lack of ‘quality islamic magazine’, I want to qualify this by saying that there has been a lack of magazines for general public because there are very high quality, nice and academic journals/magazines published by different Islamic jamiaat (universities) in Pakistan/India for many, many decades. There used to be a good women’s magazine called Batool as well.